After the service at the gypsy Church in Yambol which burnt down, we traveled to the neighboring town of Sliven for a service at the local Church of God in the Gipsy ghetto. 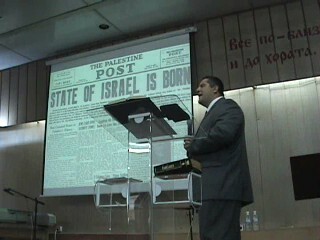 We had just held a church leadership seminar in town on August 31, 2008 and the echo of the event was still very strong. We were pleasantly surprised upon our return to Yambol with a new healing report. During the Wednesday night service in Yambol the worship team always sings the old gospel song “There’s Power in the Blood” right before we minister the word. After the song a lady that plays the violin testified that some 10 years ago, while ministering in Yambol we had asked for that same song to be sung before the message. She sang the song with the congregation while her left hand was squinched by a sickness not only causing her constant pain and discomfort, but disabling her from playing the violin. She testified that her healing a decade ago in one of our services was still powerful and real today. Little we knew that while she was testifying another lady in the congregation was suffering with a similar painful condition in the right side of her body disabling her leg and foot. During the time when we sung the songs and the testimony was presented she reported that she felt the presence of God in a very powerful way and continued to feel it through the next 48 hours. She later testified that God had healed her entirely from the pain and she confidently went to the doctor only to confirm that her condition had disappeared completely.